Fitment applicators, or fitment cappers, are designed to apply a fitment to a container. A fitments is a devices designed to restrict the flow of a product from a container. Fitments can be applied inside the container neck or can be applied around the container neck. Fitments that are designed to fit inside the neck of a container are designed with a taper so that as the fitment is pushed down into the neck of the container the fitment will fit snuggly within the neck and will not fall out once the container is turned upside down. The top of the fitment is pushed down to be flush with the top of the container neck. Fitments designed to fit around the neck of the container are pressed down around the neck of the container and the pressure of the fitment against the top of the neck holds the fitment in place when the container is turned upside down. Fitment applicators are designed to apply either a fitment designed to fit in the neck of the container or a fitment designed to fit around the neck of the container. Specifications- Automatic, Container diameter 0" to 2.00", Speeds from 100 to 250 cpm – speeds depending on materials and application. Snap capper has air assist on sorter and cap chute. Conveyor measures 3 1/4" W x 101" L and is 36" H above floor. Frame is painted c/s construction. Complete w/hopper, sorter, cap chute, and star wheel assembly. Resina Model F14, automatic, fitment applicator rated from 120 to 300 containers per minute – depending on materials and application. Fitments: 20mm to 38mm in Diameter. Containers: 2-1/2" to 5" in Height Equipped with 3.5 cu. ft. cap hopper, 22" diameter cap sorting wheel, cap feed chute, container indexing bumps wheels, 11" long side gripper wheels during cap application, 2-1/4" wide drum fitment applicator, and start / stop push button controls. Mounted on height adjustable feet. Automatic snap capper capable of 20 to 200 containers per minute. Equipped with 3-1/4" conveyor, cap hopper, pin wheel sorter, air assist cap chute and star wheel container handling components. 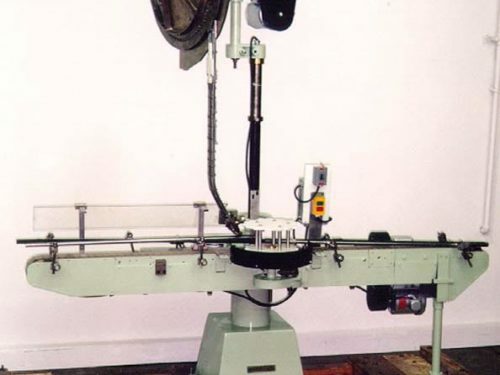 Specifications- Automatic, : Snap capper capable of speeds from 90 to 250 cpm – speeds depending on materials and application. Has air assist on sorter and cap chute. Conveyor measures 3 1/4" W x 186" L and is 36" H above floor. Frame is painted C/S construction. Unit complete with hopper, sorter, cap chute, and star wheel assembly.